Sri T.K. 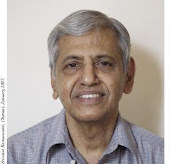 Sribhashyam, the third son of Sri T. Krishnamacharya, was born in Mysore in 1940. He obtained his Master’s Degree in Accountancy as well as in Hindu philosophy in Chennai. Right from his childhood Sri T. Krishnamacharya initiated him to Yajur Veda and taught him in the traditional way all major Upanishads, Brahma Sūtra and Bhagavad Gīta. Sri T. Krishnamacharya trained him in Yoga practice and teaching. Apart from this, he also received intensive lessons on Yoga Philosophy and Indian Psychology. Āyurveda, the Indian Medical Science, was another subject of study under his father. Sri T.K. Sribhashyam began to practise Āyurveda under the guidance of Sri T. Krishnamacharya in 1956; at the same time he also started teaching Yoga. Since 1970, he is transmitting his father's teachings in Europe. In 1999, the Mysore Sanskrit College conferred on him the title of Ācharya (Master) for his faithful and devoted teaching of Hindu philosophy. He is the Head of all Yogakshemam schools in Europe, which are recognised by the European Yoga Union. Many Yoga journals in Europe frequently publish articles written by him; European and International Yoga Conferences appreciate his regular lectures on subjects of Hindu philosophy. He is an Honorary Life Member of the International Yoga Federation and the World Yoga Council. He is married and has two children. Apart from South Indian languages, he speaks French and English fluently.